Showcasing poems by more than ninety contemporary American poets, In a Fine Frenzy reveals what Shakespeare's poetic children have made of their inheritance. 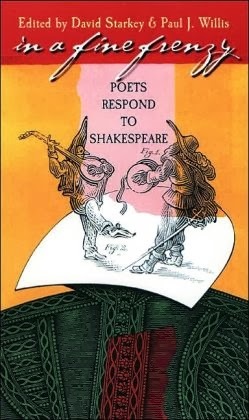 Particularly interested in Viola, Miranda, Prospero, Desdemona, Iago, Lear, Cordelia, Hamlet, Horatio, and Ophelia, the poets respond to the sonnets, the comedies, the tragedies, the romances, and, to a lesser degree, Shakespeare the man. In so doing they reveal the aspects of his work most currently captivating to modern writers. Those who cherish Shakespeare's mercurial wit will delight in the rapid shifts, from grief to hilarity, so characteristic of the bard himself. Comic poems about tragedies follow decidedly somber poems about comedies. Single poems contain multiple emotional twists and turns. Some pay homage; most interact directly with the original Shakespearean text. Collectively, they corroborate Ben Jonson's assertion that Shakespeare is "not of an age, but for all time." BUY THE BOOK ON KINDLE.